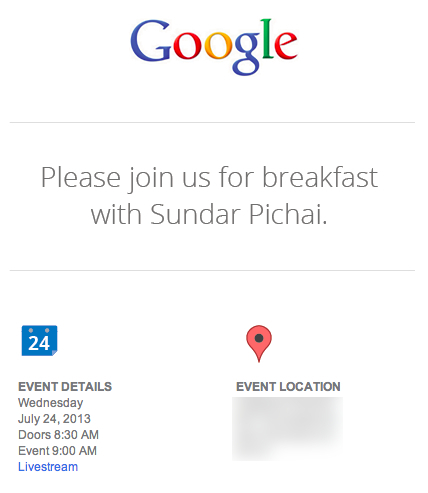 Google just sent out press invitations for a July 24th event to be led by Android / Chrome OS chief Sundar Pichai. The company isn't revealing what it plans to discuss next week, but one possibility is that we'll finally learn more about the next release of Android — version 4.3. Little is known about Google's upcoming Android revision, but we do expect it to include support for Bluetooth Smart (also known as Bluetooth low energy) devices. It also stands to reason that Google will bring the updated camera app first seen in the Google Play editions of HTC's One and Samsung's Galaxy S4 to the OS at large. Minor UI tweaks aside, it's also been some time since we've heard substantial news on the Chrome OS front. Does Google have other surprises in store? We'll be on hand live starting at 9AM PT (12PM EST) to bring you any announcements as they happen, and Google also plans to broadcast the event via YouTube.